Packers Fans: Are We the “Best Fans in Football”? The St. Louis Cardinals fans self-identify themselves as the “best fans in baseball”. This tag has led to a great deal of mocking, as well as a pretty fantastic Twitter account. The idea is to exploit the irrational tirades of fans who identify themselves as the “best fans in baseball” as they quit on their team, players, and management (and often spit out racist garbage). I found myself sitting in Lambeau Field this Sunday during a game that would decide the fate of the remainder of the season. As the only fan in my entire section making any noise with the Packers’ defense on the field, I found myself wondering, are we the “best fans in football”? 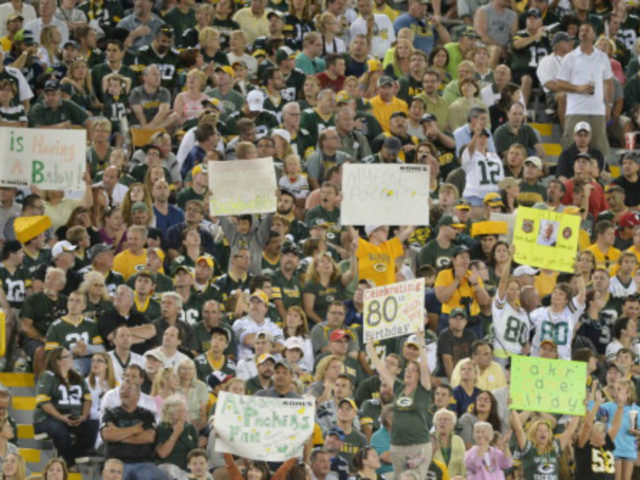 Green Bay fans have long identified themselves as the most loyal in the NFL. After all, despite going through terrible times in the 70s and 80s, the Packers have two full groups of season ticket holders (Green and Gold packages), and a waiting list that has hit six figures. There’s no threat of Lambeau looking like a Rams or Chargers home game. I can’t tell you how many times I’ve had to explain rules to people in the stands (or on Twitter). I think this has something to do with the average age of people who regularly attend Packer home games. Most fan bases have a hard time taking a long view on football games. They live and die with every play. The live and die with every game. Football is a long season, and it can be super frustrating to be patient. This is a team that currently has the longest active streak of playoff appearances (and 2nd most of all time). Yet the fan base is ready to tear it all down because they are struggling this season without the best football player on the planet. Note: I am not advocating for keeping everything in place. In fact, you’ll get to hear my opinions on coaching changes in the coming weeks. Lambeau Field is one of the best gameday experiences in the NFL (and probably in sports). However, the stadium is not anywhere near the top of the NFL in providing home field advantage from crowd noise. Too often the fans stop getting loud on defense as soon as the game gets a little frustrating (or on Sunday they never got loud at all). Too often the fans start cheering when the Packers have the ball, causing Aaron Rodgers to frantically try to get the fans to quiet down. In fact, the loudest I’ve ever heard the fans at Lambeau Field was chanting “Spongebob Squarepants” at the Family Night event. Lambeau can get loud (and it does during some really important games), but doesn’t provide anywhere near the homefield advantage that places like Seattle and Minnesota do. Two especially embarrassing moments related to the wave (all moments involving the wave are inherently embarrassing): The fans starting the wave earlier in the season while Aaron Rodgers and the offense are driving at the end of Seattle game. The fans on Sunday starting the wave when Kenny Clark is lying injured on the field. Do the right thing: stop the wave. My end analysis is Packers fans can be the best, and they can be the worst. What we need is more civil and intelligent conversation about the team. And more willingness to make some noise at our stadium. Win or lose, the Packers are the team we cheer for, and it’s time to support them through their struggles (and it looks like there will be a lot to finish out this season). This entry was posted in Andrew Mertig, Packers 2017-2018 Season and tagged fans, Green Bay Packers. Bookmark the permalink.